When performing in a conventional theatre, symphonic and chamber orchestras, as well as soloists and opera singers, encounter problems related to the projection of the sound and voice, due to the noise that is produced on the stage area in the absence of diffusion materials. Depending on the instruments, the sound that is produced by the orchestra is often dispersed heterogeneously in all directions with much of it being wasted towards the rear of the stage box. In order not to lose the sound level and all the musicality of orchestras, acoustic shells should be placed around them to channel the sound towards the audience. To project the sound it is necessary to install diffusion panels shaped like a shell, open towards the audience in order to scatter the sound in that direction. 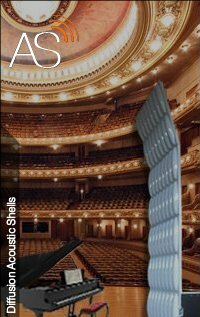 The Effectfuser® AcSh® acoustic shell may be installed on the stage ceiling and the Dynamicflow® AcSh® may be installed on the floor around the musicians. 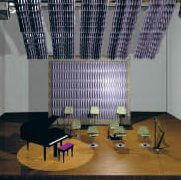 Spaces like theatres and auditoriums where classical music performances are programmed are usually large volume spaces. Thus, due to the noise from the audience and the lack of acoustic shell, electro-acoustics equipment can be over-used. The use of our acoustic shells increases the natural level of the sound that is genuinely produced by the instruments or artists and naturally increases the acoustic pressure of the room thus leading to a balanced diffusion throughout the whole frequency spectrum. Often flat varnished timber panels are used but these units, due to their large size, return the acoustic energy in very tight angles of incidence. Their scattering coefficients versus frequency are not at all well balanced. Flat panels tend to scatter only the high frequencies not the medium or lower frequencies. The Dynamicflow® AcSc® is an easy to install portable acoustic diffusion shell designed to be used in certain types of musical concerts. It is a unit that changes the room's acoustics by enhancing its natural features. It can also be used for outdoor concerts and recitals. 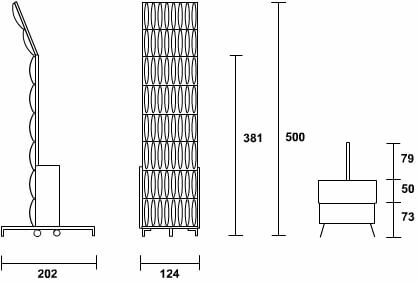 These units do not need any preparation prior to their installation, just a free stage with good access. The units are easily assembled, and dismantled, and can be stored away in the flight cases when not in use. There is no need to store the box while the shell is being used. They must be coupled and multiplied in such a way that is adequate for each project in order to obtain a diffusing area that is proportional to the space in question. Depending on the space available on the stage, more or fewer elements may be used in order to form the shape of a perfect shell. Built on a modular configuration with 120x120cm units, up to four modules can be coupled in height, thus totalling a fully diffusive surface of 480x120cm. Its scattering features improve with the application of more modules. 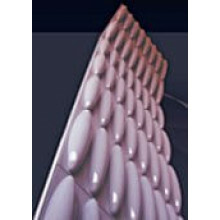 The Dynamicflow® AcSc® is a large sized diffuser that provides a very homogenous diffusion within the sound and diffuse spectrum. In order to determine the scattering coefficient simulations were carried out on raytracing during the design and development stages of the product. Diffusion with scattering effect It emphasises the sound diffusion at a wider covering angle, effective at a shorter incidence distance. Features: efficient at a shorter distance; less sound level; wider incidence angle. B - Horizontal diffusion with scattering effect (Top view). C - Horizontal diffusion with scattering effect (Side view single unit). D - Vertical diffusion with scattering effect (Top view single unit). The Effectfuser® AcSc® consists of fixed acoustic shells that are made of lateral modules of background and ceiling. These elements enable several angulations between themselves which are defined according to the degrees of incidence towards the audience. The modules are fixed to the stage's ceiling with duralumin and steel cable structures. They are moved through a system of electric motors which allows the most usual positions to be pre-programmed. When not in use the shells are gathered against the stage's ceiling and go completely unnoticed. Manufactured from ABS with a rigid framework several modules can be grouped for the desired effect. They can be hung from the ceiling in strategic positions or they can be mounted with a motorised rigging system from the stage ceiling. Their low weight makes mounting easier. Diffusion with compression effect It emphasises the diffusion at a smaller covering angle, effective at a longer incident distance. Features: efficient at a longer distance; smaller incidence angle; higher sound level. A - Horizontal diffusion with compression effect. B - Horizontal diffusion with scattering effect. C - Vertical diffusion with compression effect. D - Vertical diffusion with scattering effect. E - Horizontal diffusion with compression effect. F - Horizontal diffusion with scattering effect. G - Vertical diffusion with compression effect. H - Vertical diffusion with scattering effect.